Aberdeen has seen a 'substantial increase' in sales in the third quarter of the year. Signs of recovery in the Aberdeen housing market have been detected as the city begins to emerge from the oil and gas downturn, a new report has said. Aberdein Considine has recorded a "substantial increase" in sales in the Granite City in the third quarter of the year. 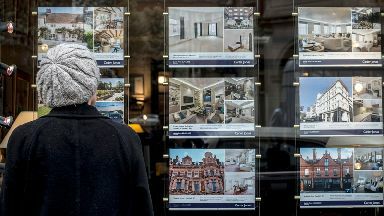 The volume of sales in the city was found to have risen by 7.9% compared to the same time last year, while the decline in prices has "levelled off" at -0.5%. The value of property changing hands in the area also saw a 7.3% year-on-year uplift, with total sales of almost £222m. The average cost of a home in Aberdeen now stands at £199,834. The report stated: "North Sea operators are expected to generate a £10bn cash surplus this year - the highest figure achieved since 2010 when the industry was enjoying a boom. "That renewed sense of confidence appears to be filtering through to the region's property market." Jacqueline Law, managing partner at Aberdein Considine, said: "The upturn in Aberdeen is great news after a prolonged difficult period, and is hopefully an indicator that we are beginning to see the north east emerge from one of its most testing downturns. "There's still a huge amount of work to do to try and get back to where we were but news of the longer term investment plans for the area, and the oil price having hit 80 dollars this year, hopefully provides the necessary level of optimism to help maintain the momentum. "Critically, the positive effects of a return to sustainable growth in the energy sector should filter through to the rest of the country, providing benefits for businesses across the supply chain." "News of the longer term investment plans for the area, and the oil price having hit 80 dollars this year, hopefully provides the necessary level of optimism to help maintain the momentum." Elsewhere in the country, East Dunbartonshire has joined Edinburgh and East Renfrewshire to become one of three regions where the average price of a home now stands at more than £250,000. The capital remains the most expensive place in Scotland to buy a home with an average price of £267,035, up 3.8% in a year. Sale volumes in Edinburgh were, however, down by 10.2% in the third quarter, reflecting a shortage of properties in the city. East Dunbartonshire rose by 9.7% to £251,547, with East Renfrewshire seeing a 1.4% increase to £265,240. Meanwhile, the report notes that homeowners "have generally regarded Brexit as having a negative impact on the value of their property". "With only 2% expecting an increase in value it is clear that very few respondents anticipate a positive outcome from Brexit," the document stated. Ms Law said: "The property market across Scotland is in reasonably rude health, and the fact that three areas have all breached the £250,000 price barrier demonstrates that there remains significant pent up demand. "However, despite the current feel good factor, we can't ignore the ongoing turbulence in relation to Brexit, as well as the corresponding uncertainty this is causing to both businesses and homeowners. "That said, the energy industry is international in nature and the return of a stable and prosperous oil and gas industry should hopefully provide some insulation against the challenges the country might face over the next few months and years."